Joyce has made a thunderous start to his professional career with some eye-catching displays and has the opportunity to showcase his ability on a huge stage. The 2016 Rio Olympian defeated Ivan Godor over six rounds in his last outing, the first time that Joyce has been extended further than the third round since turning professional. “It’s a great opportunity.” said Joyce. “The atmosphere inside the arena is going to be absolutely incredible and I can’t wait to get out there and put on a show. Crocker has exploded onto the professional scene with a series of hard-hitting displays and is now preparing to deliver another explosive performance at the SSE Arena. Since switching to the professional ranks, Crocker has yet to be extended further than the second round in any of his three contests. “It’s going to be a special night.” said Crocker. “Big fight nights are always special in Belfast but this one will be on another level. When Carl Frampton is in action the city is electric and I can’t wait to be part of it. Ward is looking to continue the winning momentum after making a flawless start to his career. It’s another Belfast fight night for the Light-Heavyweight and he’s looking forward to making his fifth appearance in his home city. Dickinson is quickly establishing himself as one of the Heavyweight division’s most exciting prospects and the Liverpool man is delighted to be a part of the action on November 18th. Two knockouts in his first two appearances have set him up perfectly for the new season and the big-hitting powerhouse is excited ahead of his third appearance. “I made my debut in Belfast and it’s great to return” said Dickinson. “It was a great atmosphere in June and I’m expecting this one to be even better with Carl Frampton back boxing in the city. Cully burst onto the professional scene with a destructive first round knockout victory over Gyula Tallosi at the Devenish Complex and is excited to feature on the big stage. An excellent spell in the amateurs has set Cully up perfectly for his professional career and he believes this is the first of many big nights in the future. Main event on an unmissable evening of action sees three-time World Champion Carl Frampton MBE make his highly-anticipated Belfast return against Mexican Horacio Garcia; all-action Belfast hero Jamie Conlan gets his long-awaited World Title shot against IBF Super-Flyweight Champion Jerwin Ancajas; WBO Bantamweight World Champion Zolani Tete makes the first defence of his crown against fellow South African Siboniso Gonya; Dublin rivals Jono Carroll and Declan Geraghty rematch for the IBF European Super-Featherweight title and hugely-popular triple Olympian Paddy Barnes makes the first defence of his WBO European Championship. 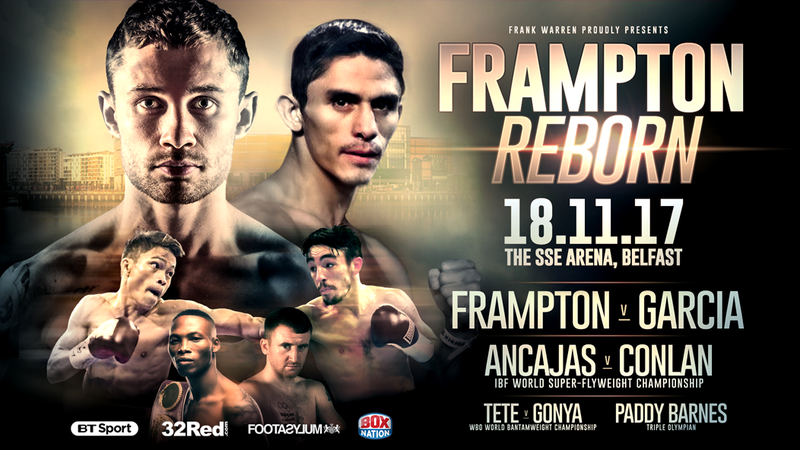 Limited remaining tickets for Frampton Reborn are on sale now via the SSE Arena Belfast Box Office, www.ssearenabelfast.com and 028 9073 9074.